Until recently I had never heard of the true story of how an American bomber with a live nuclear weapon aboard became lost over Canada. 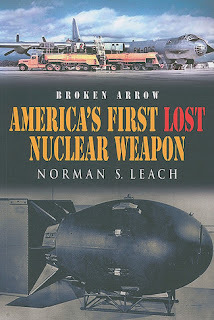 America's First Broken Arrow: A True Story of the Cold War, A Doomed Bomber and America's First Lost Nuclear Weapon by Canadian author Norman Leach, tells the tale. On the eve of Valentine's Day, 1950, an American Strategic Air Command B-36 bomber-loaded with an atomic bomb-flew into the frozen night on a simulated bombing run from Alaska to San Francisco. The engines suddenly failed on this notoriously unreliable aircraft and the crew, before parachuting into the rugged terrain of northern British Columbia, set the autopilot to take the aircraft far out to sea. Years later the wreckage of the bomber was accidentally discovered on a remote northern British Columbia mountaintop hundreds of miles from its presumed location deep beneath the Pacific Ocean. Did an atomic bomb lie undetected for a number of years in coastal northern British Columbia? Or was the nuclear weapon jettisoned and destroyed only miles from Canadian shores, becoming the world's first dirty bomb? 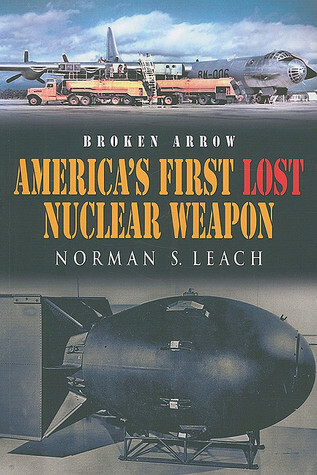 Was this America's first lost nuclear weapon? Finally, and most baffling, did one of the missing crewmembers, the last man aboard, attempt to pilot the doomed aircraft back to its Alaskan base? This compelling true-life mystery will resonate with readers in a world in which a new nuclear arms race is shaping the geopolitical climate. I found this to be a hugely interesting read. The author starts with the detonation of the first nuclear weapons during World War 2, how the Russians designed their own nuclear arsenal and the arms race that resulted from that. The B36 bomber designed for long distance attacks, sounds like an unreliable death trap for those who flew it. The original flight plan was to carry a live nuclear bomb but without the detonator on a simulated bombing run that was to never fly over Canadian territory. The fact that the plane ended up crashing in the Canadian Rockies and the terrifying story of what to do with the bomb when the plane was so close to Vancouver, shows how much can go wrong with what was to be a routine mission. The cold war may have settled down but I do wonder how many nuclear bombs are still flying around in the skies today ready for action. I enjoyed this book and found it not only well researched and written but liked the amount of pictures and diagrams that went with it that helped give the reader a better understanding of what was being explained.